Start your tour of San Clemente beaches with San Clemente City Beach. Begin at the Fishermens Restaurant & Bar, the only pier restaurant in Orange County with outdoor seating. Fishermen love to use this pier, leaning over its blue railings that match the water. San Clemente beaches north of the pier are popular with surfers, while the south side is the habitat of swimmers and body boarders (surfing is off-limits on the south side during the summer). Lifeguards caution against the strong swell here that can pull swimmers toward the pier's barnacle-encrusted pilings. Farther south, T Street beach is a surfers' favorite, with waves perfected by a near-shore reef. But during the crowded summer months, this beach is swimmers’ domain during midday; surfing is restricted to morning and evening hours. Farther north of the pier, at Avenida Pico, North Beach is a popular family beach, with ample parking and a snack bar open during the summer. 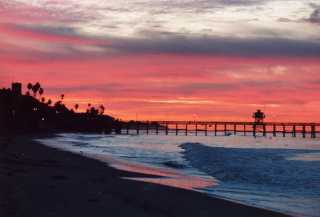 South of the city, visit San Clemente State Beach, one of the most popular of San Clemente beaches. This thin, mile-long beach nestles under sandstone cliffs, the legacy of marine terraces, from when this area was once ocean floor. The cliffs here are constantly crumbling, so park rangers warn: don’t even THINK about climbing them. But trails follow ravines that cut through the cliffs, to the day parking lot as well as picnic areas, 160 campsites with fire rings, plus an RV camping area with hook-ups and a group camping area. Nature trails and butterfly paths (first one we've come across along a Southern California beach) frame this section of San Clemente beaches, and in summers camp rangers conduct campfire programs. The beach itself is welcoming for swimmers, snorkelers and body boarders, but challenging surf breaks through most of this section keep it the domain of experienced surfers. The state beach's northernmost section, Calafia Beach, has a wider beach, an ample city-run parking lot, and a seasonal concession stand, Schleppy's at the Beach. IS THIS THE BEST BEACH IN CALIFORNIA? Just over the San Diego County line lies the 3,000-acre San Onofre State Beach, the fifth most popular beach in California and one of the state's top ten parks. This lean stretch of coastline fringing Marine Corps Base Camp Pendleton starts at the southern boundary of Calafia Beach with Trestles surfing beach, at the mouth of San Mateo Creek. Named after the railroad trestle bridge visitors have to pass under to reach the shore, trestles is a surfer's paradise. Only a cluster of waves break here, but they make up for numbers in quality: surfers consider Trestle's breaks are considered to be among the best in the world, and crowds line up daily to try their luck. Camping, RV sites with hook-ups and picnic tables are available further up the creek, at San Mateo Campground. Just south of Trestles, lies the main section of San Onofre State Beach, a magnet for swimmers, beginning surfers, longboarders and sunbathers. Follow the beach south to a surfside club and camping area for military families, nicknamed locally, "Church" for the tiny town and beach-side chapel that once stood here. The camp itself is for military families only, but the beach is public. South of Church, check out San Onofre Surf Beach, with spots carrying names such as The Point, Old Man and Dog Patch. Surf beach borders on the San Onofre Nuclear Generating Station; below the plant are four more miles of state beach, with tent and RV camping (no hook-ups) along the bluff-top roadside, and six trails down to the beach. Come back soon to our San Clemente Beaches page: we'll be adding more dining, activities and accommodations news. 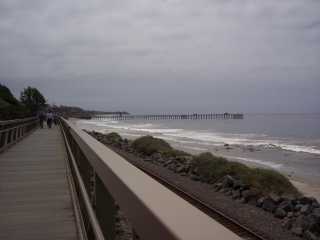 Return from the San Clemente Beaches page to the home page.